A short biography of French Impressionist artist and anarchist Camille Pisarro. At the end of the nineteenth century, anarchist ideas had a notable influence not just among workers but also in literary and artistic circles in France. Many were the writers and painters who enthused at the idea of social revolution. For certain of them, it was no more than fashion; they abandoned their ideal when success and fortune came. But others, like Paul Signac, stayed faithful all their lives to anarchism. Among them, one finds Camille Pissarro, the hundredth anniversary of whose death was celebrated in 2003. He was born in 1830 on St. Thomas, a Caribbean island that was then a Danish possession. His father was a Jewish tradesman of Portuguese origin. He thought that his would follow him in business, but Camille profited from the visit to St. Thomas of the Danish painter Fritz Melbye and followed him to Venezuela. He started painting landscapes, flora and fauna. In 1855 at Paris, he took a course in fine arts, without much enthusiasm. He was a pupil of Corot and was influenced by the realism of Courbet. In 1857, at the Swiss academy, he met the future impressionists Monet, Renoir and Cezanne who became his friends. In 1870, the Franco-Prussian war obliged him to flee to England. He left behind him 1,500 canvasses which were destroyed by the soldiers. The paintings of Constable and turner influenced him. Returning to France, he painted at Louveciennes and at Pontoise, often with Cezanne. His painting became more and more airy, close to that of Monet. His paintings presented the life and work of villagers. Today, crowds descend in mass on each new Impressionist exhibition. But, in that period, intolerance towards novelty was incredible. In 1874, Monet, Pissarro, Sisley, Renoir, Cezanne and Degas organised an exhibition. All the press ridiculed them. Le Figaro notably wrote: “They opened an exhibition which they said was of painting…5 or 6 mad people, including a woman, met there. These so-called artists took canvasses, colour and brushes, threw several tones around haphazardly and signed the lot”. In derision, they were called impressionists. Three years later, they proudly claimed this description. Despite the interest of several art dealers and collectors, it was difficult to sell the paintings. Pissarro had to produce a lot support his family (he had 7 children). Often he could not buy his painting material. His material situation did not get better until 1879. In 1884, when he was living at Eragny-sur-Epte an exhibition of his paintings was very successful in the United States. Pissarro was already aware of anarchist ideas. If he preferred the Republic to a restoration of the monarchy, his letters show that he had no illusions about politicians. As an artist of the avant-garde, he was disgusted by bourgeois society. He refused authority and exalted the individual. Anarchism permitted him to explain his own concept of beauty. The reading of the works of the anarchists Peter Kropotkin, Pierre Proudhon and Jean Grave convinced him of the need for social revolution. 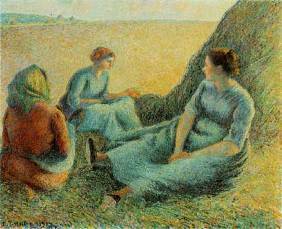 On the technical level, he drew close for a short period to the method of Seurat and Signac and adopted the principle of systematic division (pointillism or neo-impressionism). Despite numerous criticisms, from 1890 his exhibitions were a great success and the value of his paintings rose. You do not find open declarations of anarchism in the painting of Pissarro. His work consists of landscapes above all, and several portraits and still lifes. After 1890 he also realised wide views of urban sites (Paris and Rouen). For him the villages and fields are a representation of Utopia and had to be protected for the future society from industrialisation. Pissarro participated in the Club de l’art social (The social art club) in 1899 alongside the sculptor Rodin, and the anarchist militants Grave, Emile Pouget and Louise Michel. He was a partisan of art for art’s sake. “All the arts are anarchist! When they are beautiful and fine!” He was not favourable to art with a social message. Unlike Kropotkin in his book The Conquest of Bread he did not think it was necessary to be a peasant to render the poetry of the fields in paintings. He wanted to share the liveliest emotions with his fellows. For him a beautiful piece of art was an attack on bourgeois taste. Pissarro was an optimist who saw an anarchist future soon to come, where people, freed from religious and capitalist ideas, could appreciate his art. In 1890 he realised an album of 28 quick pen sketches for two of his nieces. Entitled ‘Les Turpitudes Sociales’; they mercilessly depict Money, the Stock exchange, Capital, religion, the Bosses, Wage slavery, Poverty, Hunger and Suicide. Hope is represented by a barricade scene and by a sketch where an old philosopher watches a sun rising over the letters of the word “Anarchie”. Pissarro was not a violent man but he understood the reasons for the anarchist bomb attacks of the 1880s. After the assassination of President Carnot by Caserio, Pissarro had to take refuge in Belgium, like the anarchist men of letters Octave Mirbeau and Bernard Lazare, from the repression against anarchism. There he met the anarchist geographer Elisee Reclus and the poet Emile Verhaeren. His moral and financial support towards victims of repression was important. He helped the children of imprisoned anarchists, Emile Pouget, and Italian comrades in exile. He regularly paid off the debts of the newspapers of Jean Grave, La Revolte and Les Temps Nouveaux. His friend Jean Grave founded Les Temps Nouveaux in 1895. This newspaper was regularly published up to 1914. Many artists favourable to anarchism contributed to it: Luce, Cross, Signac, Van Rysselberghe, Aristide Delannoy, Valloton, Steinlen, etc. Pissarro only contributed 3 lithographs but his financial support was very regular. He encouraged his sons, Lucien, Georges and Rodo, all artists themselves, to send their own drawings to the paper. He also gave some of his works as prizes in lotteries organised to support the paper. During the anti-Semitic hysteria surrounding the Dreyfus affair, he struggled against injustice and anti-Semitism alongside Octave Mirbeau and Maximilien Luce, but broke with Degas and Renoir who took opposing positions. He died in Paris on November 13, 1903 at a time when his artistic achievements had finally begun to be widely recognised. The above article was adopted from one by Felip Equy in the French anarchist paper Le Monde libertaire.